eThekwini in hot water after allegedly misleading Supreme Court of Appeal. The eThekwini Metro could find itself in a seriously compromised position if allegations that it misled the Supreme Court of Appeal (SCA) are found to be true. In May 2017 the council appealed an order granted by the High Court in Durban for a multi-level, half-built, 11-storey luxury building on Durban’s Berea to be demolished (nose190 & 212). Lawyers for the metro council argued at the SCA hearing that eThekwini shouldn’t be held accountable for the unauthorised actions of just one employee – “the administration official” – and downplayed the “errors” to argue that the demolition order granted was excessive. The city told the SCA judges that, to the extent that there were irregularities, they were of a “far lower order of severity”; there was no evidence that the municipality had acted in a “biased and fraudulent manner”; and the city’s infractions that might lead to liability for the council, were not exceptional as there was “no evidence of bad faith, fraud or corruption on the part of the administrative official”. The SCA upheld the appeal in favour of the council. But Noseweek has discovered that a 36-page report completed in December 2015 by Mbuso Ngcobo, head of the City Integrity and Investigative Unit (CIIU) – which has since been kept hidden from public view – reveals that eThekwini was fully aware, when arguing before the SCA, that in fact it was not just one staff member’s minor infraction – there were at least six senior employees involved and all had been found “in dereliction of duty” and to have failed to perform the functions of their office “in good faith, diligently, honestly and in a transparent manner”. Furthermore the city’s own investigative unit produced a report agreeing with Durban High Court Judge Esther Steyn’s June 2015 order which ruled that the rezoning of the property on 317 Currie Road from a standard residential plot to one that could accommodate end-to-end construction, had been “irregular”. It found that neighbouring residents were not given the opportunity to object, along with other inconsistencies – enough to give credence to the argument that the processes were somehow corrupted on purpose. Judge Steyn had found the council and the developers, Serengeti (see below), failed to inform the affected neighbours of the proposed change of zoning or give them details about the proposed development. She said the council had underplayed its role in the rezoning and “seemingly blames one individual for the mistake”. Neither the city nor the developer could “convincingly show that the rezoning was rational or lawful”. Based on the city’s arguments and submissions, the SCA found that Judge Steyn’s order “lacked clarity and certainty” and did not “exercise discretion in determining a just and equitable remedy”. But at no point did the city tell the SCA that between the high court ruling and the SCA hearing their own Integrity and Investigations Unit confirmed the findings of Judge Steyn and had gone beyond it, uncovering further violations and irregularities. • Mr Lihle Phewa, deputy head: development and planning, be charged for violating Schedule 2, Section 2(b) and (d) of the Code of Conduct for Municipal Staff Members in that he signed the report recommending approval of the application for rezoning... knowing that the matter had not been resolved by the JAC. Three other members of staff in the department – Ravi Naidoo, Charles Tree and Vaughan Boden – were found to have acted improperly and been “in dereliction of duty” but had left the city’s employ by the time the report was finalised, thus couldn’t be put before a disciplinary committee. The unit received the complaint from affected resident and campaigner against the development, advocate Tayob Aboobaker. He asked the city to investigate whether the demolition of the previous structure on the site was demolished legally and queried the legality of the rezoning of the property from General Residential 1 to General Residential 5, which drastically changed the floor space and size of the building that could be built on it. In 2018 Aboobaker submitted a Promotion of Access to Information Act (Paia) application for the report, which was turned down, as was his appeal. When contacted by Noseweek, he was considering approaching the court to get an order to have the document released. “The public requires a full explanation as to why this report was not disclosed by the municipality and why it was not disclosed to the SCA. The municipality is not a private litigant; it was duty bound to place the information before the court. Had it done so the result at the SCA would have no doubt been different,” he said. He added that he now felt “vindicated by the contents of the report” and that it was a “crying shame the SCA had not come to terms with the machinations that led to the rezoning of 317 Currie Road and the passing of these atrocious plans”. He called on the city to inform the SCA about the investigation’s contents and to get an order to stop the development. “I want to caution prospective developers who may be… taking advantage of a town planning department that is running amok in the Berea, that any rezoning beyond a GR2 zoning is likely to be unlawful and that their greed may come back to haunt them,” said Aboobaker. eThekwini, Musa Mbhele, city spokesperson Msawakhe Mayisela replied stating: “It appears from the substance and the accusatory tone of your narrative and questions that you have neither fully comprehended nor appreciated the subject matter of the Municipality’s appeal to the Supreme Court of Appeal. He said the city had no duty to disclose the report to the SCA or the public as it was “immaterial to the issues that were before [the SCA]”. “The CIIU reports are never made public by the municipality, they only become public when they are leaked because they are meant to be internal control documents. The CIIU reports are issued to the relevant stakeholders within the municipality, both political and administrative. The DA in Durban, which has been consistently opposed to the building, is expected to file a notice of motion with the eThekwini speaker’s office early next year asking for a detailed probe into its Department of Planning, Management and Environment. The DA wants the executive committee to instruct the City Integrity and Investigations Unit [to conduct] an investigation into the Development, Planning, Environment and Management Department over a “growing number of allegations around corruption and mismanagement” surrounding the department and its “inability to properly enforce bylaws”. DA ward councillor Chris Pappas whose jurisdiction covers Currie Road, criticised the city’s “serious lack of enforcement” of its bylaws and regulations “and often it seems land owners are not supported”. 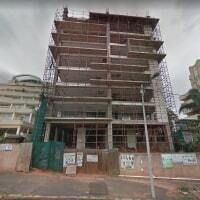 The developer of 317 Currie Road, Serengeti Rise Industries (Pty) Ltd, has continued with construction since the SCA ruling, but confining work to the interior only. However it is clear that the legal battle has set them back significantly financially with several service providers having reportedly not been paid for services rendered. In September the company providing scaffolding to the building obtained an High Court order to be paid R20.9 million, including interest. Nela Kahle 35 CC claimed that in July 2015 it launched an application to get an order compelling Serengeti to return the scaffolding. The matter has dragged on, with the scaffolding still on site. But on 28 September Judge Dayalin Chetty said the developer must pay R20.9m rental to cover the period from August 2015 to June 2017 and would continue to be liable for rental as long as the scaffolding remains – which Noseweek estimates to be in the region of R15m. Serengeti has taken the matter on appeal. The SCA also did not do their homework in the case presented to them about the street renaming fiasco in and around Durban a few years ago either. eThekweni Municipality had formed so called "Ward Committees" which were barely advertised prior to their formation and consisted predominantly of ANC members and when the DA challenged the whole non consultative basis for the street renaming the SCA ruled in eThekweni's favour that the fact there were ward committees and they had agreed to it was in effect a sufficient consultative basis. In this case Judge Esther Steyn delivered a totally correct judgement which the SCA should have upheld. I only hope that there is still a way ( Constitutional Court?) to hit this vipers nest trading as eThekweni Municipalty with a successful challenge and see this illegal building reduced to rubble.